I enjoyed Pitch Black when I saw it in the cinema in 2000 or so. While there were a number of silly coincidences and a pretty unlikely ecosystem crucial to the story, it was a fun sci-fi action movie with an engaging anti-hero, Riddick. The sequel The Chronicles of Riddick was a bit of a misfire, although I still enjoyed it more than I expected. I reckon that the biggest problem with it was that it that seemed incongruous with Pitch Black: it didnt feel like the same universe to me. I think that too many exotic elements were introduced to the franchise at once, particularly compared to the stripped down microcosm seen in Pitch Black. Insert Tough Guy Talk Here. Apparently the next Riddick movie (which I read somewhere is in casting around now and is currently titled Riddick) goes back to the formula for Pitch Black (a badass anti-hero beats up space monsters with a shiv or rocks or household items). This is a good thing I think. 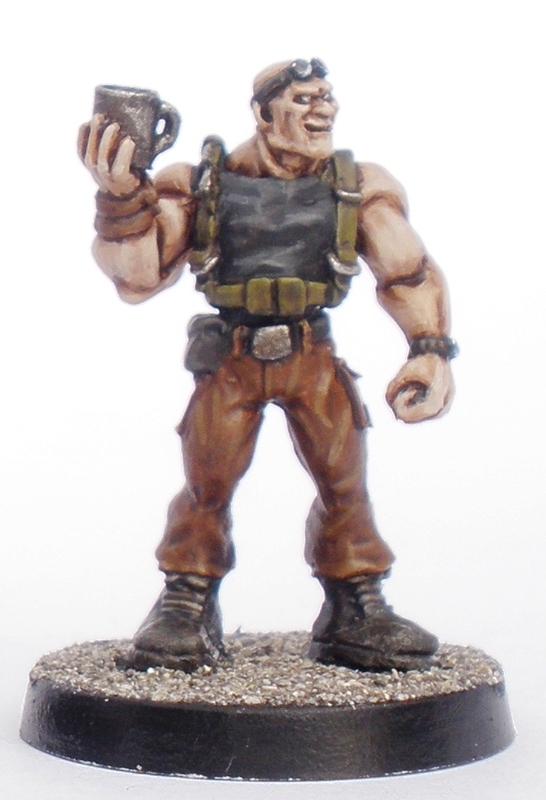 This “Ruddock” figure is from Heresy. I bought it about three years ago and finally got around to paining it recently. I painted it while half watching The Chronicles of Riddick which slowed down painting progress but helped with identifying wardrobe elements. Plus it is a silly and fun sci-fi film with a decent budget so I enjoyed it. Because I cant seem to stop myself from experimenting while painting, I overdid the contrast on the flesh a little. It doesnt bother me too much as I quite like my figures looking a little cartoony, but it was basically the same error that I made with this figure almost two years ago. Ho hum. Live and learn. Or in this case live and never learn. “Live and Never Learn” sounds like the name of a Bond movie. Its a better name than Quantum of Solace anyway. Incidentally, the figure carries a tin cup because during The Chronicles of Riddick when threatened by a guy with a big space rifle, Riddick threatens to kill him with a cup. Naturally the guy subsequently gets the cup rammed into his chest. I have the same miniature, though stil not painted. 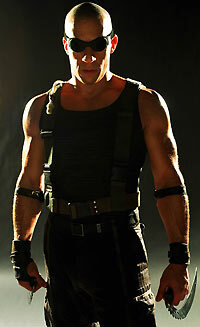 Riddick is hard as nails! I like the brown pants on him, I may do that as well! And yes he is a D.D. player. He mentioned it on a show at sometime. The outfit that the figure is sculpted wearing is the one worn during the middle of “Chronicles”, around the time that he kills that guy with the cup. His trousers are brownish grey but as is often the case in movies, the lighting from scene to scene makes it hard to pin down. I went with a slightly warmer brown, just to give some variation in the model. Thanks for the feedback lordsiwoc.